The aqueduct is a technology that has survived the test of time. Yes, aqueducts are history but they are also progress. 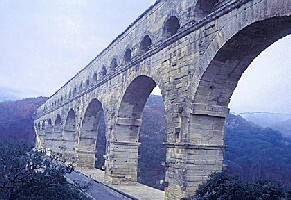 Roman aqueducts exploited the principles of gravity in order to deliver water to the city. Water, collected from a source (catch basin), travelled through a closed conduit, usually subterranean, to its distribution tank or terminus (castellum). Water lines were also carried above ground on bridges, arcades and "raised embankments". In order to remove impurities and particulate matter from the flow, settling tanks (piscinae) were installed at various points between the source and castellum. The "public sector" philosophy regarding distribution patterns was indeed socialistic. The aqueduct's primary purpose, in theory, was to provide the masses with bountiful supplies of water. Naturally their was a water tax, and this was determined by the size of the calix that was connected to the distribution tank. Furthermore, a premium was instituted for all private deliveries. What will become increasingly more apparent are the scope and scale of the benefits that the aqueduct yields. For example, other than pure monetary gain, the aqueduct allowed for the implementation of impressive monuments, buildings and fountains. These examples allude to the propagandistic nature of the aqueduct; for an emperor could not only rally around his contribution of an augmented water supply, but also utilize that water to fuel recreational areas for the public. Roman water works - baths, aquaducts and "Frontinus on the Water Supply of Rome"
The Waters of Rome - An interactive archive of the hydrological history and urban development of the city of Rome from 753 BC to the present day!